An example of the light curves (left panel), and spectra (right panel) of a new CL AGN J0831+3646. Credit: Yang et al., 2017. (Phys.org)—A group of astronomers led by Qian Yang of the Peking University in Beijing, China, has detected 21 active galactic nuclei (AGN) of a rare type known as changing-look AGNs. The finding, reported November 22 in a paper published on arXiv.org, doubles the number of such objects known to date and could improve our understanding of evolution of AGNs. An AGN is a compact region at the center of a galaxy, more luminous than the surrounding galaxy light. They are very energetic due either to the presence of a black hole or star formation activity at the core of the galaxy. Astronomers generally divide AGNs into two groups based on emission line features. Type 1 AGNs show broad and narrow emission lines, while only narrow emission lines are present in Type 2 AGNs. However, observations revealed that some AGNs transition between different spectral types. To date, fewer than 20 such objects have been found, and they are known as changing-look (CL) AGNs. Now, Yang's team reports the finding of 21 new CL AGNs, which significantly increases the number of known objects of this peculiar class. The discovery is a result of analyzing sets of comprehensive spectroscopic and photometric data from the Sloan Digital Sky Survey (SDSS), and observations conducted with the Large Sky Area Multi-Object Fiber Spectroscopic Telescope (LAMOST) in China. "We present surveys of CL AGNs in the SDSS spectra archive, the LAMOST spectra archive, and observation for some CL AGNs candidates selected from photometric data. In total, we discover 21 new CL AGNs, in which the spectral types changed from Type 1 to Type 1.8-2, or vice versa," the researchers wrote in the paper. According to the study, five of the 21 newly discovered CL AGNs were found by repeat spectra from the SDSS. Ten CL AGNs were discovered based on repeat spectra from the SDSS and the LAMOST, and the rest was selected from photometric variability in optical and mid-infrared imaging data, confirmed by new spectroscopic observations. The researchers revealed that out of the 21 new CL AGNs, eight transited between type 1 and type 2 classes, 11 transited between type 1 and type 1.9 classes, and the remaining two changed between type 1 and type 1.8. Moreover, the authors reported that 15 of the newly detected CL AGNs turned on, with broad Balmer emission lines emerging, and exhibited increased broadband flux, while broad Balmer lines of the rest disappeared, accompanied by dimming in the continuum. They also found that 15 CL AGNs exhibit variations of more than 0.2 mag in the mid-infrared during transition. The team now plans more detailed studies of the CL AGNs described in the paper. They will analyze the spectra and imaging data in more detail, and discuss their probable transition mechanism. This could uncover insights into the physical mechanism behind transitions of AGNs, providing new information about the evolution process of these objects. "The rare CL AGNs provide exceptional cases for M-σ∗ relation studies at higher redshift with non-AGN phase spectra and AGN-phase spectra. We plan to estimate their black hole masses from the M-σ∗ relation, and compare with their viral black hole masses obtained from the single epoch spectra," the astronomers concluded. The rare case of changing-look (CL) AGNs, with the appearance or disappearance of broad Balmer emission lines within a few years, challenges our understanding of the AGN unified model. We present a sample of 21 new CL AGNs at 0.08<0.58. The new sample doubles the number of such objects known to date. 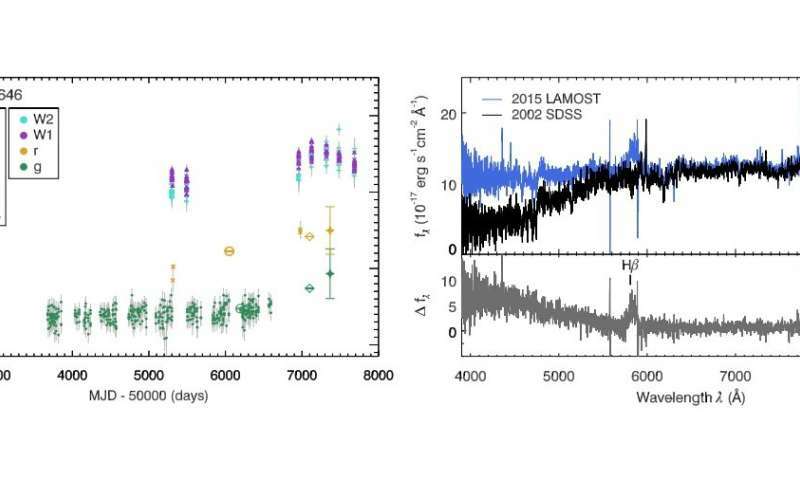 These new CL AGNs were discovered by several ways, from repeat spectra in the SDSS, repeat spectra in the Large Sky Area Multi-Object Fiber Spectroscopic Telescope (LAMOST) and SDSS, and from photometric variability and new spectroscopic observations. The estimated upper limits of transition timescale of the CL AGNs in this sample span from 0.9 to 13 years in rest-frame. The continuum flux in the optical and mid-infrared becomes brighter when the CL AGNs turn on, or vice versa. Variations of more than 0.2 mag in the mid-infrared W1 band, from the Wide-field Infrared Survey Explorer (WISE), were detected in 15 CL AGNs during the transition. The optical and mid-infrared variability is not consistent with the scenario of variable obscuration in 10 CL AGNs at higher than 3σ confidence level. We confirm a bluer-when-brighter trend in the optical. However, the mid-infrared colors W1−W2 become redder when the objects become brighter in the W1 band, possibly due to a stronger hot dust contribution in the W2 band when the AGN activity becomes stronger. The physical mechanism of type transition is important for understanding the evolution of AGNs. However, observations revealed that some AGNs transition between different spectral types. To date, fewer than 20 such objects have been found, and they are known as changing-look (CL) AGNs. Why should that seem surprising? Since AGN's are growing from within more and more massive, and more and more active in ejecting new matter therefrom, should it not make sense that their spectral condition should change as well, depending on their current state? And if there is a narrow condition in which the transition happens, wouldn't that imply that the observation of this transition state is relatively rare? The processes in the universe are permanent, are not static and unchanging. "This implies the existence of no less than two types of galaxy centers, which structurally differ from each other. The first type is created by the growth of stellar clusters and the start of cyclones in the center of an irregular galaxy, while the other is gaseous-liquid and is formed by the stellar growth. With the increase of the rotation speed and the formation of cyclones in the center, the first type galactic centers overgrow into a gaseous-liquid form (this implies the existence of transitional phases).